The KS2 production rehearsals have begun! More details will follow in soon. Year 5 will play a major part in the chorus and some smaller acting positions for a few of our class. We are off to the library on Wednesday. 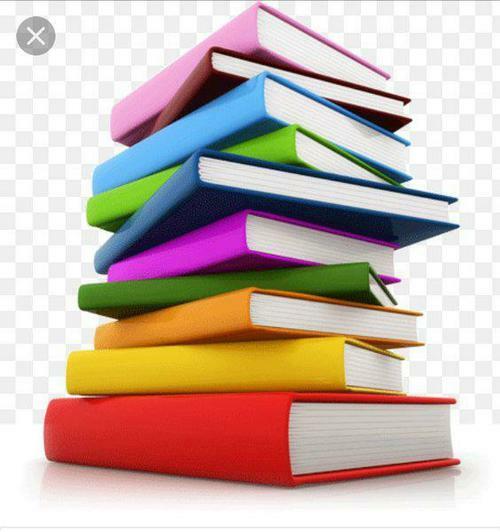 Research has shown that the children who perform better in comprehension tests (SATS reading test) are the ones who read! We are trying to encourage reading for pleasure in our daily carousel and this will start to include using the ipads. Please encourage your child to read as a recreational activity. 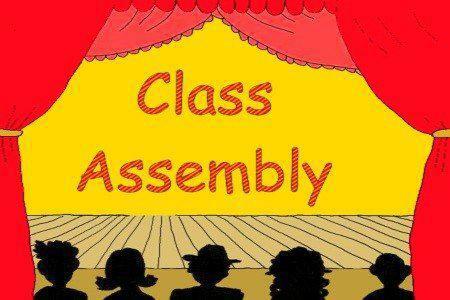 Our class assembly was fantastic. 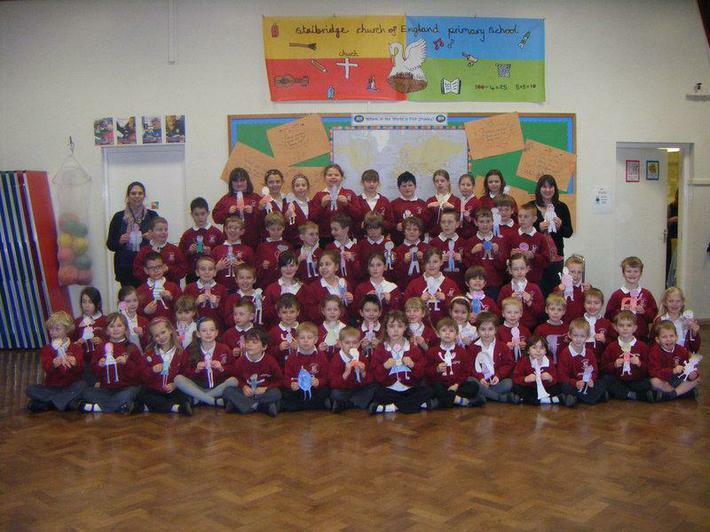 All the children looked amazing and spoke really clearly. Thank you to all who came and supported the children. We had a fantastic afternoon making sock snowmen, Christmas trees and a Christingle. Thank you to everyone who joined in the festive fun! 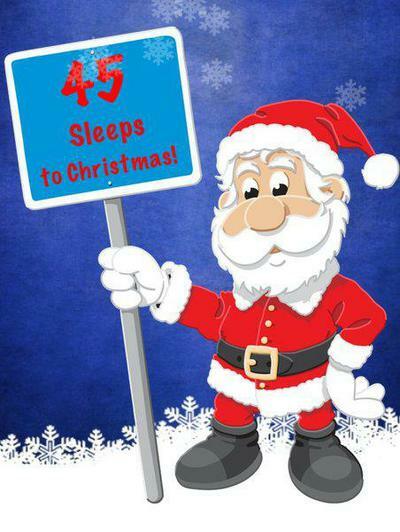 Christmas is coming in 45 sleeps!! We will be practising our carol for the Ks2 carol concert and getting some ideas for the Christmas craft afternoon. Exciting times ahead, and lots of busy working, as we countdown to Christmas! 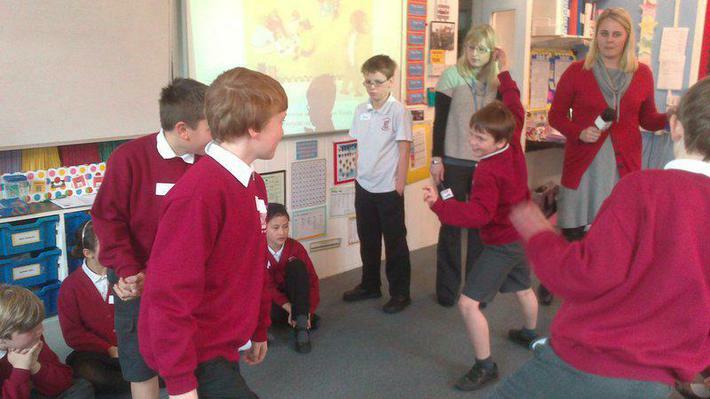 Year Five had a great time at Sturminster Newton High School on Friday, 10th June. We made muffins, investigated virtual and augmented reality, explored photoshop, went on the climbing wall in the Youth Centre and rated a range of vintage computer consoles. 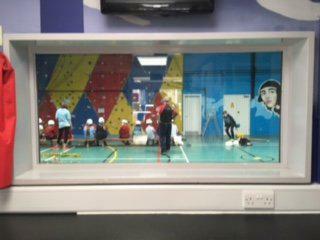 A busy but interesting day, especially as we mixed with children from other schools in our pyramid. Thanks to all the parents who came to the VE Day party on May 27th. We had a good time looking at all the projects and amazing work the children had done during our Life on the Home Front topic. We hope you enjoyed our rationing tea and were impressed with the children's presentations. 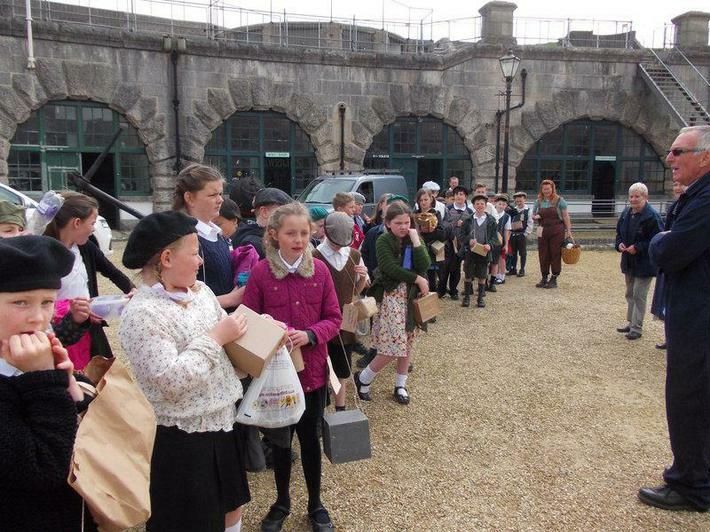 We had a great trip to Nothe Fort this week. We were transported back to 1941 and really enjoyed being evacuees for the day- we were glad to get back to the 21st century though! 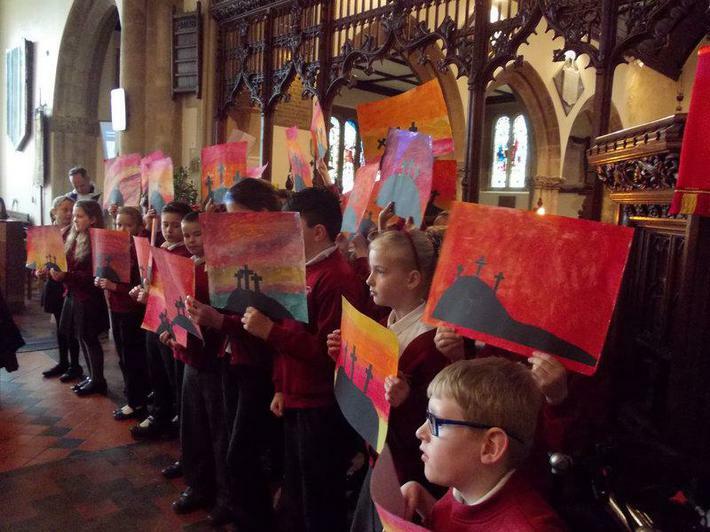 We had a lovely time performing in the Easter Service and showing our art work about forgiveness. 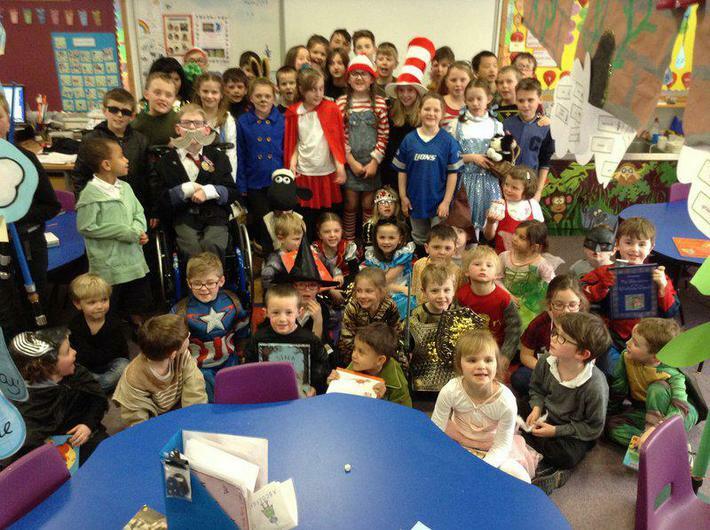 We celebrated World Book Day with our Year 1 buddies. Can you guess which characters we dressed up as? 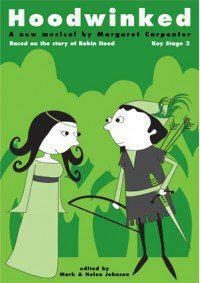 Our new topic after the half term holiday will be the Mysterious Mayans. We will be learning about Ancient Mayans in History. We will be looking at temples, pottery and creating some masks. Our first topic of 2016 is based around Earth and Space. 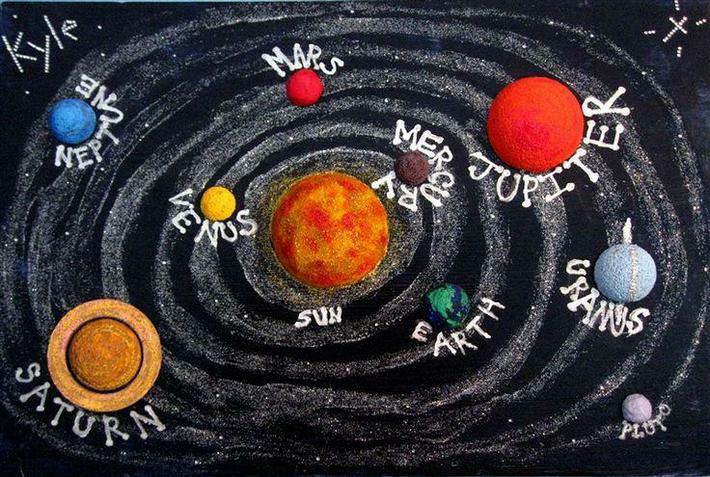 We will be studying space in Science and looking at Australia in Geography. Our Art and Design Technology work will all have a space twist too. 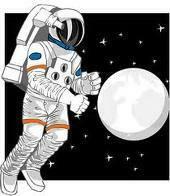 In English we will be thinking about imaginary worlds and writing from the point of view of an astronaut. We had a great time making Christmas Sock Snowmen and calendars. Some of our parents came in and helped us with our crafts too. We all really enjoyed ourselves. This week has been road safety week. We had a visit from Neil, a road safety officer, from Dorset Police who told us how to be safe on the road as a pedestrian, when were were cycling and when we were a passenger in a car. We then designed posters to share his advice with others. Year Five have had fun experimenting with the new toys for the playground. We are looking forward to fun filled play times. Our focus in Maths for the past two weeks as been measures. We have looked at imperial and metric units and perimeter. 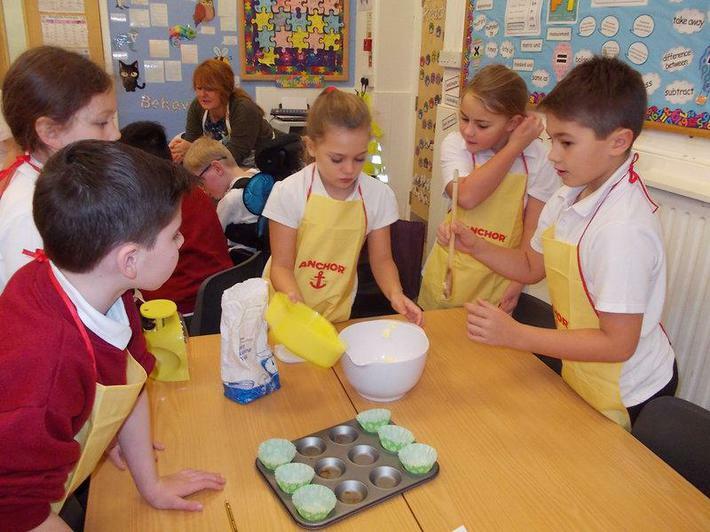 Today we used scale readings and imperial measures to make some rock cakes. 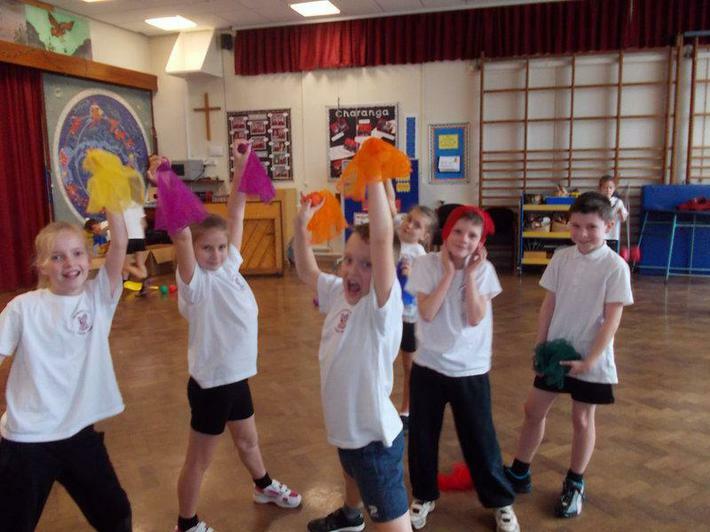 Year Five had a great day on Monday, 19th October. Mike Downton came into school and did lots of amazing survival skills with us. He taught us how to build shelters, use bows and arrows and light a fire to cook food on. We made camp bananas and smores which were delicious. We also learnt Morse code and semaphore. 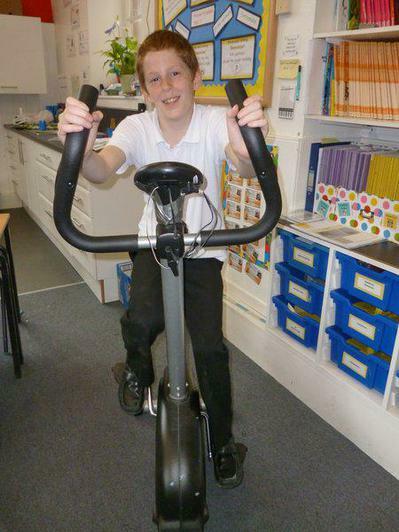 To support Mr Lomas-Walker who has been completing a John O'Groats to Land's End Cycle to raise money for the pool, we have been cycling in school. Here is Oakley doing his bit. 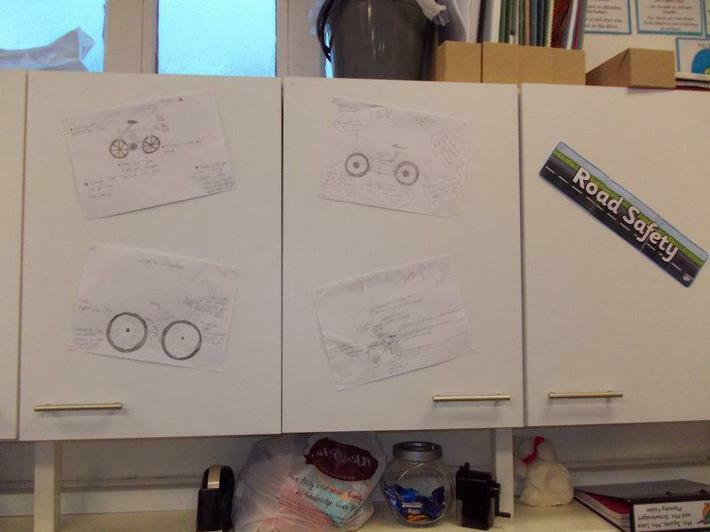 We cycled 17.5 miles in our class. Well it was a relief for the class when Maizie White decided to complete a sponsored silence for a whole hour! Think the thumb sucking was a good startegy to stop talking! 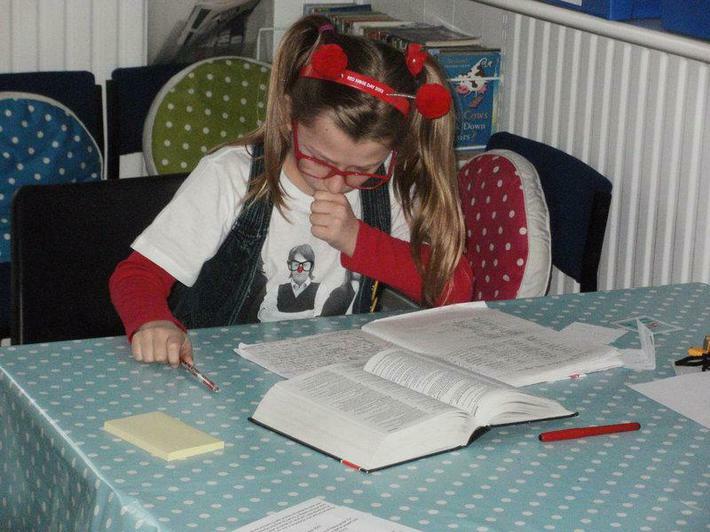 Maizie raised over £170 for Comic Relief. FANTASTIC MAIZIE - WELL DONE! 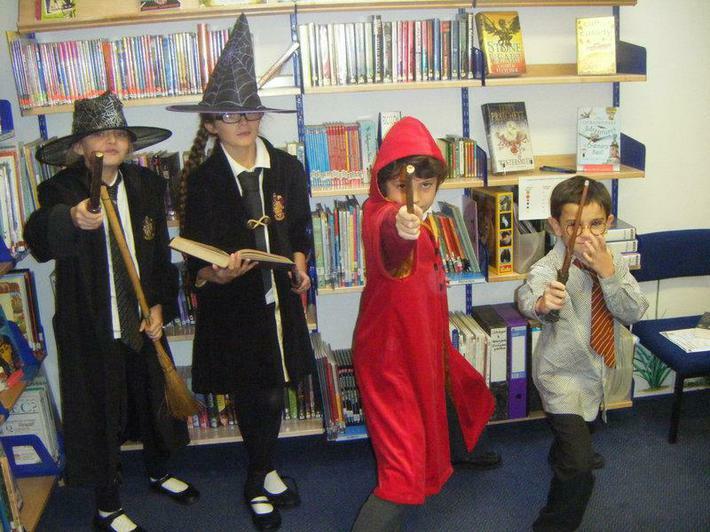 Thursday 7th of March was World Book Day. 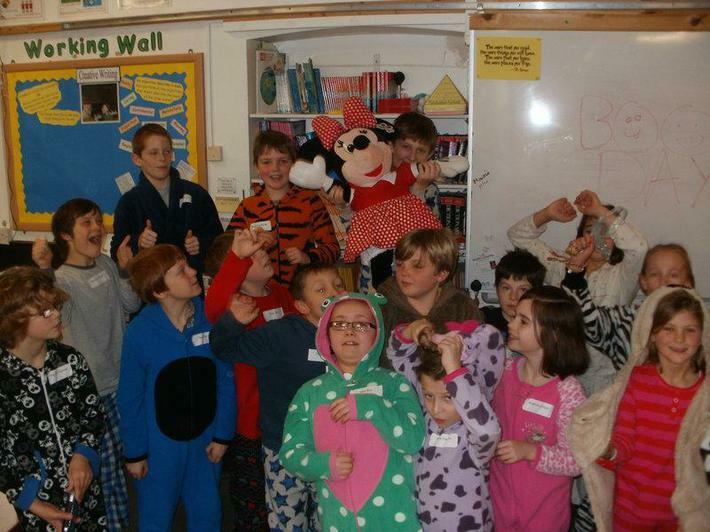 We enjoyed dressing up in our PJs and working together with the other classes to create bedtime storybooks. The whole school were lucky to have a group of Trainee Teachers come in to take some drama workshops. Here are some of the class in a freeze-frame. We were thinking about how it felt to be left out with no-one to play with. 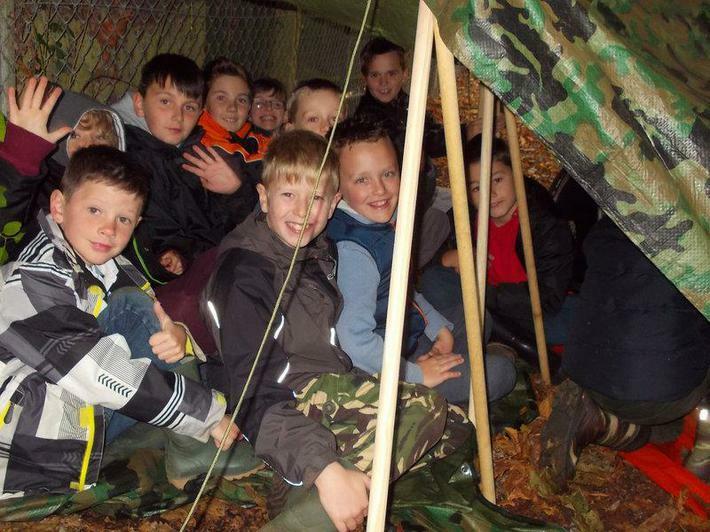 We are very proud of our brilliant Anderson Shelters that we made for our WWII project. 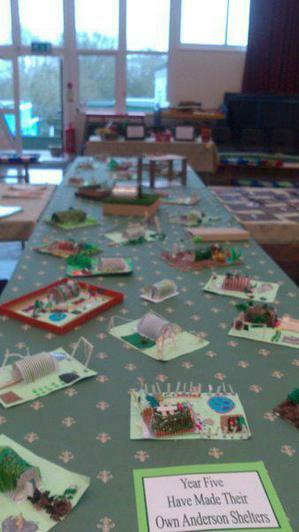 Here they are on display at parent's evening. 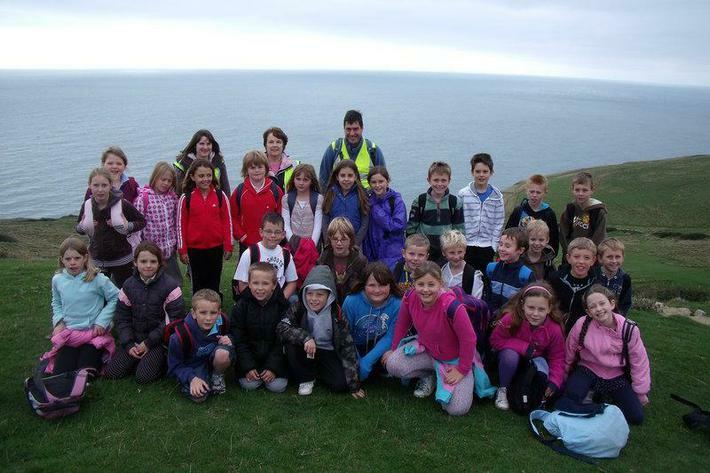 On Friday 3rd February, Year 5 will be going on an exciting trip to Nothe Fort in Weymouth. The children will enjoy a World War II evacuee experience day where they will take part in activities such as singing in an air shelter, going to school in 1940 and visiting a war time shop. The children will need to dress as evacuees for the day and will need to bring a packed lunch with war time food. For full details please see the letter that the children brough home last week. Feel free to see me after school or on the playground with any further questions. The Official Launch of Flat Stanley! Thursday 3rd March was World Book Day. Year 2 and Year 5 read the story of Flat Stanley who gets squished by a bulletin board and is able to be posted all around the world! We made our own Flat Stanleys and they too are ready to be posted around the world via our family and friends. We will track their progress as postcards and emails from around the world are sent back to school and pin the places visited on a big map of the world in the hall. Please send your Flat Stanley off to the first host family as soon as possible if you haven't already done so. 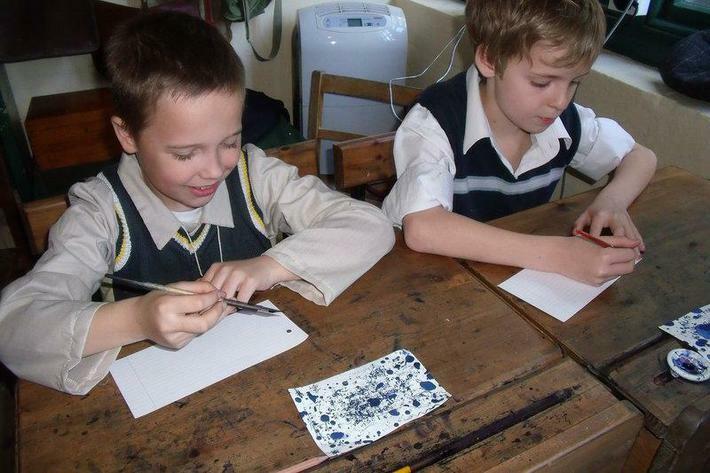 A big thank you to everyone who came to support the children on Potter Night. The children had a fantastic time and enjoyed showing off their films! A letter will be coming out shortly about purchasing DVDs. 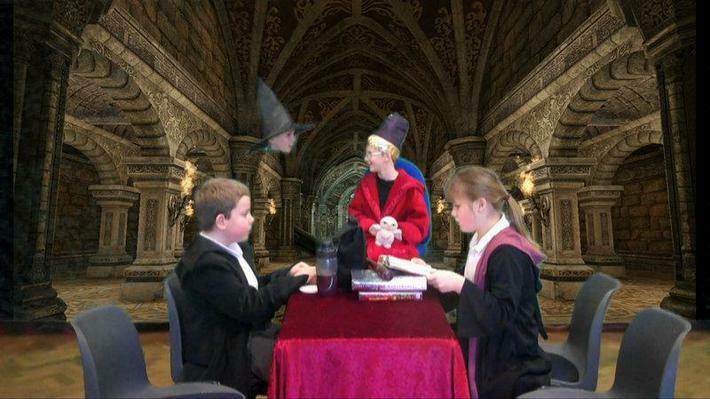 Potter Night has been provisionally booked for Thursday 3rd March 2011 at 6.30pm. We will confirm this date in a letter soon. Many thanks to all those parents, grandparents, aunties and uncles and friends who came along with the children to Space Night. It was a big success and although it wasn't quite the night for star gazing, we still all had fun in the star dome and playing with Stellarium. We all had a brilliant time at Leeson House! 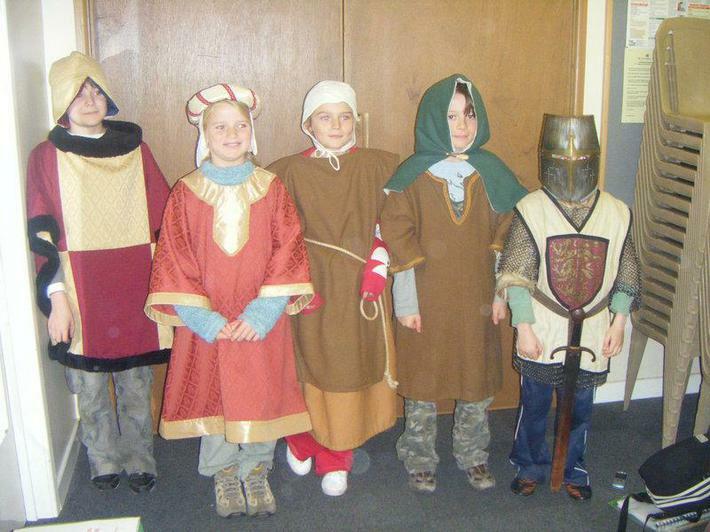 The children enjoyed trips to Corfe Castle and Wareham and I don't think that the children will forget the long walk half way through the week! Here's a picture of the class during the walk. The children in year 5 will have swimming lessons from 9am - 10.30am on a Wednesday morning. They will learn the basic strokes as well as water confidence and life-saving skills. There is also the opportunity for the children to join swimming club on a Tuesday after school (3.15 - 4pm). 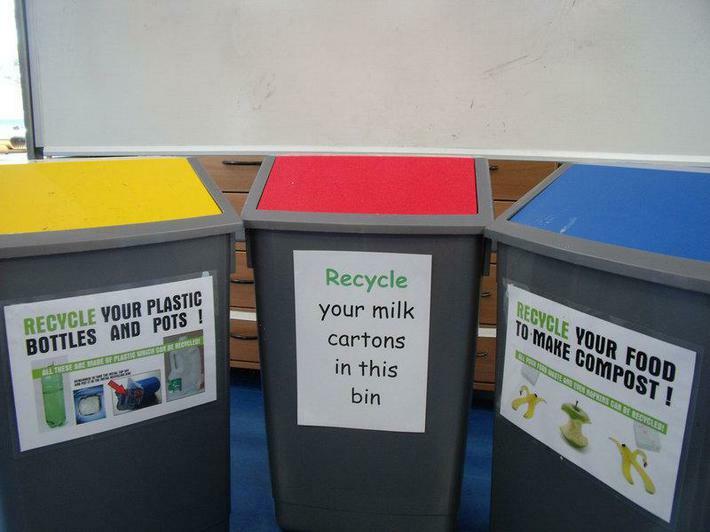 On wednesday 16th June year 5 will be visiting the household recycling centre and landfill site in Wareham. We will leave school at 9am and hope to be back at 3.30pm. A letter with more details will follow shortly. 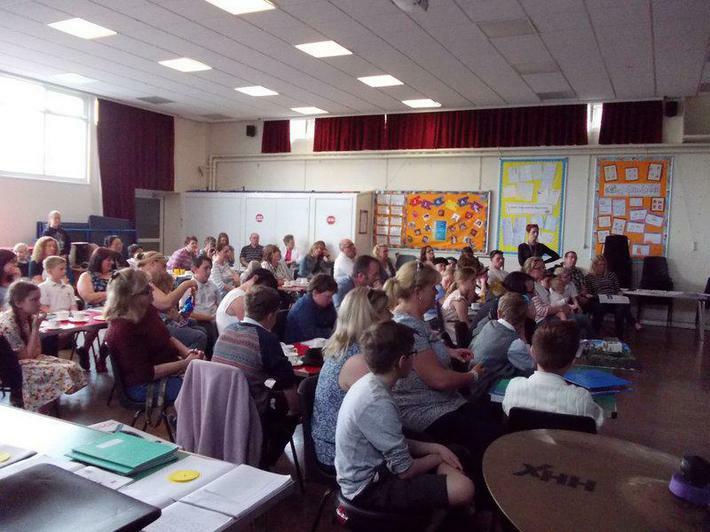 Thank you to all friends and family of year 5 who attended our Potter Night. 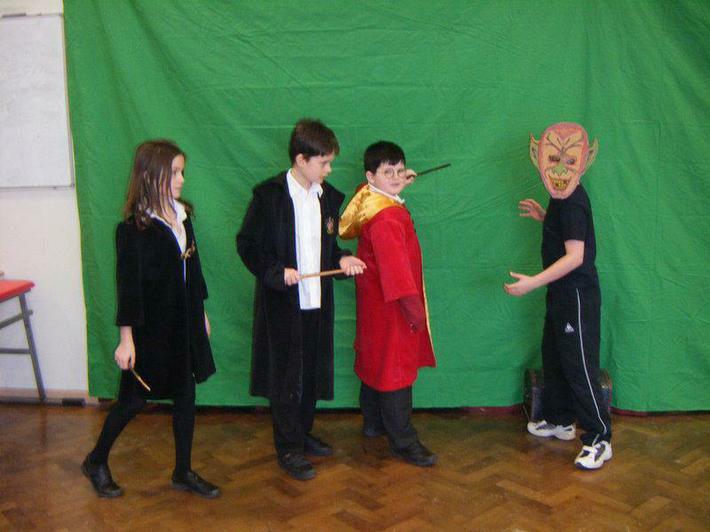 During the evening the children had the chance to show off their script writing and acting talents as we showed 7 of the children's Harry Potter movies. Thank you also to those families who bought the DVDs, we will be able to put the money to good use in the summer term. A big thank you to Mr Fieldhouse for helping to make it all possible. We had a great time at Leeson House! The Kingfishers had a fantastic time at Leeson House. We enjoyed a trip to Corfe Castle, night time orienteering, a historical walk around Wareham, a geology workshop and star gazing. 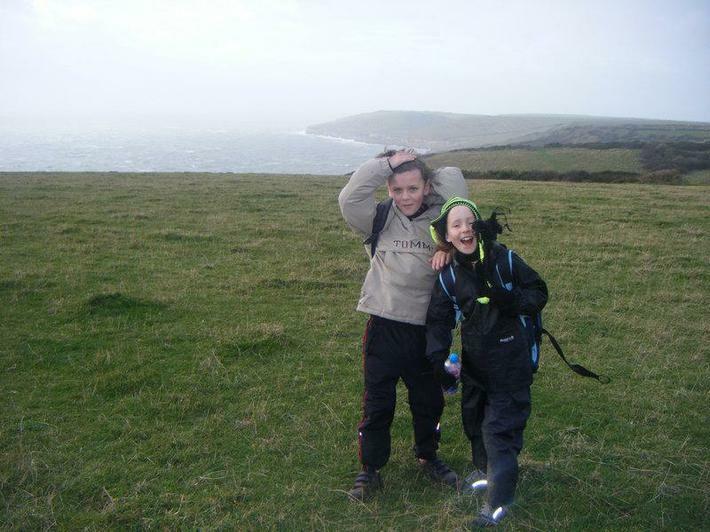 Not to mention what felt like a million mile hike in the wind with the whole class on Wednesday! Well done to all those Kingfishers who had their trainers filled up with mud and water or who fell over in the mud and didn't complain once! A particular well done needs to go to Mrs Smith who walked about 2 miles in her socks after her walking boots broke into several pieces! !